Gradual progress for Jimmy Shergill's career in 2012, foretells Ganesha. Almost 15 years after he first faced the camera for the revolutionary flick, Maachis, Jimmy Shergill today is basking in the glorious success of his latest flick 'Saheb Biwi Aur Gangster'. This suave, chocolate-faced actor has made an impressive contribution to the Indian cinema through his roles in critically acclaimed films like the controversial Haasil, the hard-hitting A Wednesday, and the heart-wrenching Yahaan. With an explosive package of immense talent and sweet boy-next-door looks, Jimmy made a promising entry into Bollywood in the year 1996, but gradually slipped into character roles in movies like Mohabbatein, Hum Tum, and Dus Kahaniyan. While he has tasted success umpteen times as a supporting actor through hits like Mere yaar ki shaadi hai, Munnabhai MBBS, My name is Khan, and Tanu weds Manu, he has not managed to strike the right chord with the audience as a lead actor. Aside from Bollywood, this prolific actor has also ventured into Punjabi cinema, and does one Punjabi film a year. 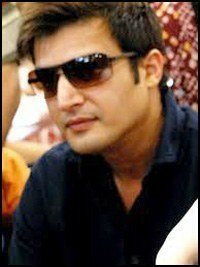 Jimmy Shergill will celebrate his birthday on 3rd December. Ganesha, with the help of Vedic Astrology, predicts the future of this Bollywood actor. 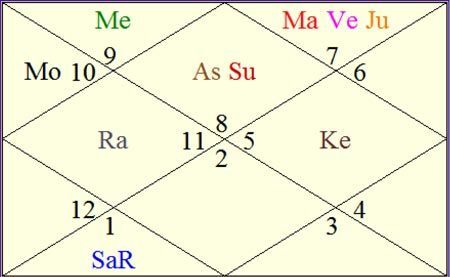 Rahu is currently transiting over his Natal Sun. This transit will continue until the end of 2012. Jupiter is currently transiting over his Natal Saturn, which is retrograde. Transiting Jupiter aspects Natal Venus, Mars and Jupiter. Post May 2012, transiting Jupiter will be aspecting Natal Sun. Saturn is transiting over Natal Mars, Venus and Jupiter. Saturn will keep transiting through the same sign throughout the year 2012. The transits of Rahu and Saturn will be a cause for concern for the versatile Jimmy during 2012. Another thing that stands out in his chart is the conjunction of Jupiter, Venus and Mars in Libra. With Saturn transiting through this conjunction, this indicates that Jimmy will add fresh skills to his acting repertoire during 2012. While he will be selective in his choice of films, preferring quality over quantity, his performance-oriented roles will leave audiences asking for more. Due to Rahu's transit over his Natal Sun, Jimmy will need to keep his public behaviour in check, as image-tarnishing challenges are predicted. In a nutshell, Jimmy may face some tough times in the year ahead, but his talent and sheer willpower will ensure he makes his presence felt in every film he does. May Lord Ganesha bless Jimmy Shergill with great success in the year ahead!